We’d love your help. 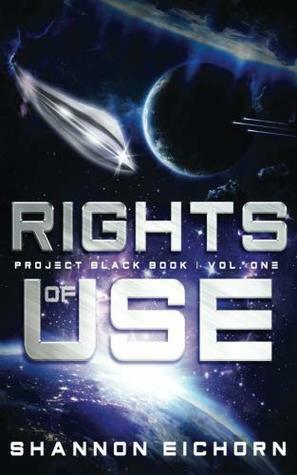 Let us know what’s wrong with this preview of Rights of Use (Project Black Book) by Shannon Eichorn. Sarah Anderson yearned for an escape from her new In the 1960s, Project Blue Book assured America that no aliens visited its amber waves or shining seas. Sarah Anderson yearned for an escape from her new life in PA, but not for this: being kidnapped by aliens and faced with a choice between having a Kemtewet queen erase her brain or sharing her body with a Gertewet insurgent. Unless the Air Force can rescue her in time, it’s either death or a chance to make a difference in the galaxy, because with Sarah, the Gertewet have one last shot to end the Kemtewet Empire and free billions of humans subject to their body markets. You are not alone on August 28, 2018. To ask other readers questions about Rights of Use (Project Black Book), please sign up. It took me entirely too long to finish this -- I kept getting distracted by other books. But whenever I picked it up I fell right back into the world of Sarah, Maggie, Vinnet, Katorin, and all the rest. I loved the characters; their voices were each distinct and I really dug Sarah's vibe through the whole thing. It got a little wordy in spots for my taste, but it was understandable: Shannon's trying to construct a whole new universe, introduce readers to it, and also plug in the conflict between It took me entirely too long to finish this -- I kept getting distracted by other books. But whenever I picked it up I fell right back into the world of Sarah, Maggie, Vinnet, Katorin, and all the rest. I loved the characters; their voices were each distinct and I really dug Sarah's vibe through the whole thing. It got a little wordy in spots for my taste, but it was understandable: Shannon's trying to construct a whole new universe, introduce readers to it, and also plug in the conflict between the characters. Looking forward to the next one! This is a fantastic book, which I recommend for everyone. It has everything a sci-fi fan might want (aliens, government conspiracy, spaceships) but it is also one of the most accessible sci-fi novels I’ve read in some time. I would recommend it to readers who are new to the genre as well as those of us who have been reading sci-fi since before we can remember. Unusually for the genre, (though this is changing with more and more novels like this coming out), it features a female protagonist that i This is a fantastic book, which I recommend for everyone. It has everything a sci-fi fan might want (aliens, government conspiracy, spaceships) but it is also one of the most accessible sci-fi novels I’ve read in some time. I would recommend it to readers who are new to the genre as well as those of us who have been reading sci-fi since before we can remember. Unusually for the genre, (though this is changing with more and more novels like this coming out), it features a female protagonist that is both strong and believable. And she’s not the only one, either – all the characters are well-rounded and have a depth that keeps them interesting, and keeps you reading (even when you know you really should go to bed). While Rights of Use makes great use of the age-old ‘Alien Cover Up’ conspiracy, it doesn’t fall back on the lazy tropes of ‘humans are good and aliens are bad’. While in some ways it’s an invasion story (on an individual scale as well as a global scale), in reality it is so much more, covering themes are particularly poignant at the moment. Overall, it is an exciting but nuanced story, and an enticing introduction to what promises to be a great series. It’s got aspects of everything that made me love sci-fi in the first place, but brings it up to date and tells it in its own way. I can’t wait for the next book! Sarah Anderson and Maggie Rockefeller are two ordinary teenage girls who find themselves thrust into an I felt I pretty much had to read Rights of Use the moment I read about its central concept: namely, a civil war between body-possessing alien symbionts over the fate of humanity and of Earth. Kemtewet infest and wipe the minds of human hosts, viewing them as bodies and nothing else; the opposing Gertewet view humans as friends and partners, meanwhile, and share the body between the two of them. Disclaimer: I read this book during the editing process, and I consider the author a friend; however, I can't wait to buy a hardcopy version of this novel of my very own. I thoroughly enjoy science-fiction of all forms, but there's something comforting about a delicious blend of epic space opera and an Earth oblivious beyond classic UFO sightings. I find it cliche to describe a book as a mix of one popular thing plus another popular thing, but Rights of Use is everything I love about the Stargate universe combined with everything I love about modern space opera such as Catherine Asaro's Skolian Empire series and Rhonda Mason's Empress Game series. Thoroughly detailed world-building where you are forced to learn about all of those details along with a delightfully diverse mix of sympathetic characters. This was a book I could have easily devoured in one or two sittings (the second sitting necessary because this text is space opera length and a break might be needed for such paltry things as eating or sleeping). Once I own a hardcopy, I probably will revisit the book so that I can read for enjoyment rather than with an editorial eye. I envy those of you who will get that opportunity as your first reading. Honestly this rating is a 3.5 stars. In the 1960s the US government declassified information about UFO sightings or unidentified flying objects. What they didn't release was the information on the alien sightings and abductions they had identified. Project Black Book is so secret that even the Speaker of the House, Andrew Rockerfeller, doesn't know about it. That is until several woman are abducted- including the Speaker's daughter, Maggie. Among the abducted are two teenage girls, Sarah Anderson and Maggie Rockerfeller. These two find each other and attempt to find a way back to Earth. Along the way they find out more than they'd like to about the body possessing aliens that are out there. The girls were abducted by the Kemtewet, who’ll wipe the minds of their human hosts so their bodies can be used as interchangeable clothes. The Gertewet that prefer to share mental and physical control might seem like the better option. But really Sarah and Maggie just want to go home to their lives on Earth and not end up in the middle of an alien war that threatens Earth. There is so much intricate world building that it took a while to get into the book, but by the halfway point I was in absorbed. At first I was really getting confused by which aliens were good and who has bound to who, but repetition solidified it... it just took longer than I wanted. It helped to remember the G in Gertewet is for good and the K in Kemtewet is for kill. Honestly the only reason I gave this book such a low rating is that it just took so long to be able to picture and understand what was going on with the aliens. The aliens and their culture are really fascinating and I loved seeing how they work (once I could picture it). They’re like little lizard/ snake/ tapeworms that burrow into a human body and use it. They can tap into the nervous system of their hosts and from take control of the mind and body. The Kemtewet are more than happy to just kill the host’s mental abilities and take over completely. While the Gertewet prefer to share, like the alien and host both have driving controls and switch off, it’s still a little unnerving to spend the rest of your life with another brain in your body. The Gertewet do talk and hold internal dialogs with their hosts. Which sometimes became confusing as to whether host or alien were talking. In the ‘60s, Project Blue Book disproves of the existence of aliens and UFOs. But in modern days, Project Black Book knows better. Flying saucers exist (known as kaxan), transporting alien symbionts called the Kemtewet, who come to earth to abduct young girls to host their Queens. When Sarah is abducted, she is faced with an impossible choice. Host an Kemtewet Queen, who cares nothing for her and will wipe out everything she is. Or, Sarah can side with the Gertwewt insurgents, hosting one of thei In the ‘60s, Project Blue Book disproves of the existence of aliens and UFOs. But in modern days, Project Black Book knows better. Flying saucers exist (known as kaxan), transporting alien symbionts called the Kemtewet, who come to earth to abduct young girls to host their Queens. When Sarah is abducted, she is faced with an impossible choice. Host an Kemtewet Queen, who cares nothing for her and will wipe out everything she is. Or, Sarah can side with the Gertwewt insurgents, hosting one of their operatives as they try to overthrow the Kemtewet Empire. The Gertewet claim to value choice and despise forcing a host, but when faced with two aliens who can control you at will, the lines between bad and worse blur. The Gertewet and Kemtewet reminded me a lot of Autobots and Decepticons. Basically the same species, divided into two factions with very different ideals. I’d say this was decent for a debut. I don’t normally like books with younger main characters, but I warmed up to Sarah near the end. There was also another young girl named Maggie who I greatly admired throughout the book. She was very level-headed, though I would expect nothing less from the daughter of the Speaker of the House. I also thought another character named Vinnet was pretty cool. The three star rating mostly came down to the fact that this book didn’t click with me. I’m a big sci-fi reader, but this felt very light on the sci-fi aspects. There were too many familiar human elements cultures for behaviour wise for my tastes. There are a few small niptpicks. Some of the Kemtewet names are nigh on unpronounceable. I’m left wondering how the author came up with them. I found some of the scenes at the beginning of the book jumped between past and present tense a bit awkwardly. The internal speech between some symbiont characters and their hosts could have been better done to indicate which one of them was speaking. There was a few twists at the end of the book I didn’t expect. It definitely make me wonder what’s next in store for the sequel. Overall, I’d recommend giving this book a shot, especially if you’re into stories with these types of aliens (ex. The Host, Animorphs). I think even people who aren’t big on sci-if will be able to enjoy this type of book. Aliens. An interstellar rebellion. Conspiracies and plots. All these, and humanity stuck in the middle with the fate of Earth in the balance? Talk about high stakes! This one starts fast & then cranks up the action to eleven. There are a lot of names to follow, but they're all memorable and entertaining, and the deft handling of humor and tension kept me turning pages to see what happened next. First in a series I will definitely be following to the end. The book is well worth the read and is also suspenseful and fun. The plot was twisty, full of surprises, and kept me turning pages. The world-building/main idea was original and well thought-out. The characters were flawed and human though ironically some were aliens. The dialogue moved the story along and sounded real. Give this book a try, you won’t be disappointed.